We provide professional house removals in Chesterfield and surrounding areas for local, national and international moves. With a reputation for excellent service, our team will ensure your move is stress free. Whether you’re relocating from Chesterfield to pastures new or have found your perfect home in the city, it’s important to enlist support from specialists with the skills and experience to ensure your move runs smoothly and is as stress-free as possible. 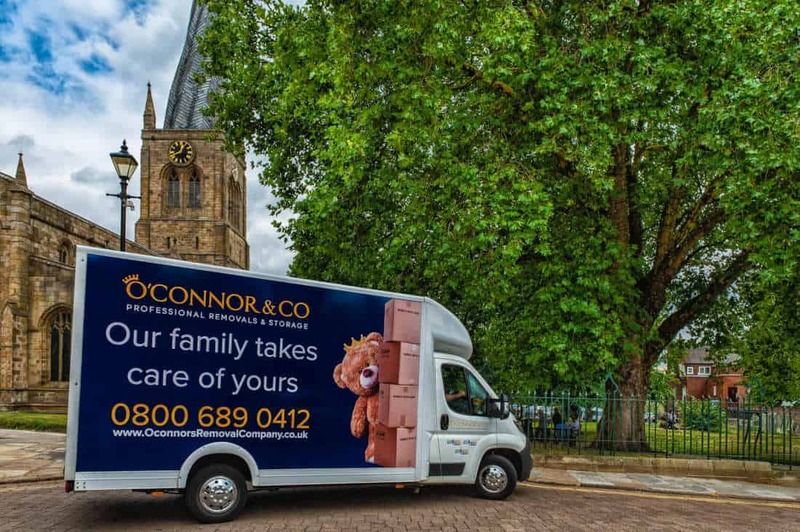 At O’Connors we provide professional house removals in Chesterfield and surrounding areas for local, national and international moves. With a reputation for excellent service, our dedicated team is with you every step of the way to guarantee the best possible start to life in your new home. Why Choose O’Connors Removals Chesterfield? O’Connor & Co have bases in Chesterfield and Mansfield – an area we know and love. We’ve helped many customers move to or from the region over the past few years – offering an award-winning service put together with your needs and preferences in mind. Chesterfield is an area of outstanding natural beauty with stunning scenery – but there’s a downside to this when it comes to relocating heavy furniture and organising the logistics of vans and larger vehicles. Narrow winding lanes, unusual property layouts, restricted access and other potentially disruptive issues could delay or spell disaster on moving day for those unaware or inexperienced in the unique features and characteristics of the region. As we’re Chesterfield born and bred we know how to handle the twists, turns, ups and downs of the local landscape – taking each element in our stride to ensure a swift and smooth relocation. We will also help you to plan your move, offering support that fits in around your unique requirements. If you are packing yourself we can provide advice and tips to help you properly package up and protect those awkward items to ensure everything arrives safely at its destination. If you would like a free no obligation removals quote then please get in touch, we offer site visits, video surveys as well as self-surveys. We offer a range of moving packages to choose from, tailored to suit a variety of different requirements. We also understand that every move is different – so we’re happy to be flexible and adjust where necessary to suit your individual needs. Choose from a variety of standard removal services right up to our Platinum Package which includes full packing and unpacking services – ideal for those who are busy, need some extra help or have an imminent removal date. We provide a full removal survey in advance to give you an accurate quote – no hidden fees, unwelcome surprises or added extras. You can opt for either a home visit by our representative or organise a video survey at a time that is convenient to you. Downsizing? Staying in temporary accommodation because you can’t move into your new property straight away? We can arrange secure storage for short or long-term periods. Whether you need a safe place to store one off items or need to stow away a houseful of possessions we have a variety of flexible solutions to meet your needs – so you can enjoy full peace of mind knowing that everything is secure and in the safest of hands. Our secure warehouse compound is protected with infrared CCTV and alerted with fast response technology. We collect your possessions, store and then deliver them back to you as soon as you are ready. Looking for a Chesterfield moving company with the experience and expertise to fully support your move? Get in touch today to organise a no-obligation quote with our friendly team.